NEW YORK, NY--(Marketwired - Mar 17, 2015) - Atlantic Records has announced today's release of FURIOUS 7: ORIGINAL MOTION PICTURE SOUNDTRACK, the official musical companion to Universal Pictures' upcoming action-thriller. The album is available today in stores and at all online retailers; FURIOUS 7 opens in theaters and IMAX on April 3. 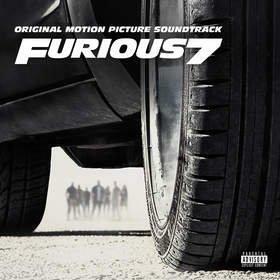 FURIOUS 7: ORIGINAL MOTION PICTURE SOUNDTRACK gathers never-before-available tracks from some of today's most electrifying hip-hop and R&B artists, including superstars like Wiz Khalifa, T.I., Young Thug, Iggy Azalea, Flo Rida, Sevyn Streeter, Price Royce, Juicy J and Mos Def, to name a few (see below tracklisting). In addition, the soundtrack includes the first-ever album release of DJ Snake & Lil Jon's five-times RIAA platinum-certified worldwide smash, "Turn Down For What." FURIOUS 7: ORIGINAL MOTION PICTURE SOUNDTRACK is highlighted by such electrifying new singles as "Ride Out" from Kid Ink, Tyga, Wale, Y.G., Rich Homie Quan. Topping the airplay charts at both MTV2 and MTV Jams, the track's companion video has logged nearly 6 million streams at Atlantic Records' official YouTube channel, www.youtube.com/watch?v=X7rdg_tKzKQ. Meanwhile, the soundtrack's "See You Again," from Wiz Khalifa (Feat. Charlie Puth) https://www.youtube.com/watch?v=lzVqwbCrSsQ, is impacting now across all radio formats nationwide. Wiz celebrated the powerful track last night with a high-profile TV appearance on NBC's The Tonight Show Starring Jimmy Fallon. "See You Again" has also been featured in TV spots for Universal Pictures feature film. Next up is a performance of "See You Again" on NBC's The Voice, slated for April 8th (check local listings). As if that weren't enough, Wiz Khalifa & Iggy Azalea's "Go Hard Or Go Home" -- yet another soundtrack exclusive -- has drawn more than 5.6 million plays and counting on the official audio at www.youtube.com/watch?v=D_VRSFpUcp0. Adding to the blockbuster pairing of music and the big screen, a number of additional tracks from FURIOUS 7: ORIGINAL MOTION PICTURE SOUNDTRACK have premiered in recent weeks, including "Payback," from Juicy J, Kevin Gates, Future, Sage The Gemini, which received over 1 million views in the 24 hours following its exclusive WorldstarHipHop.com premiere. Other new audio/lyric videos from the soundtrack include T.I. & Young Thug' "Off-set," Sevyn Streeter's "How Bad Do You Want It (Oh Yeah)," and "Prince Royce's "My Angel," official video, which, as the sole Latin single from the soundtrack, received a dual world premiere exclusively via Telemundo and the nationally syndicated Extra. The FURIOUS 7: ORIGINAL MOTION PICTURE SOUNDTRACK companion videos can be viewed now via the official FAST & FURIOUS YouTube channel: www.youtube.com/playlist?list=PLMJpN-NQ4cVh1Oxuexsh6YwVWEYIRklgO. Presented through an exclusive partnership with Dodge, America's mainstream performance brand, the FURIOUS 7: ORIGINAL MOTION PICTURE SOUNDTRACK companion videos feature some of the most powerful and the fastest Dodge vehicles, such as the 645 horsepower Dodge Viper GTS. "FURIOUS 7: ORIGINAL MOTION PICTURE SOUNDTRACK" was produced by Atlantic Records President of Film & TV and GRAMMY® Award-winning soundtrack producer Kevin Weaver (Boardwalk Empire, The Fault In Our Stars, Girls Volumes 1 & 2, True Blood Volumes 1 & 2) and Warner Music Group President of Worldwide A&R, Mike Caren (Trey Songz, Wiz Khalifa, Ed Sheeran, T.I.). Continuing the global exploits in the unstoppable franchise built on speed, Vin Diesel, Paul Walker and Dwayne Johnson lead the returning cast of FURIOUS 7. James Wan directs this chapter of the hugely successful series that also welcomes back favorites Michelle Rodriguez, Jordana Brewster, Tyrese Gibson, Chris "Ludacris" Bridges, Elsa Pataky and Lucas Black. They are joined by international action stars new to the franchise, including Jason Statham, Djimon Hounsou, Tony Jaa, Ronda Rousey, Nathalie Emmanuel and Kurt Russell. Neal H. Moritz, Vin Diesel and Michael Fottrell return to produce the film written by Chris Morgan. "FURIOUS 7: ORIGINAL MOTION PICTURE SOUNDTRACK"